What’s In It? All my favorite things! Arugula and/or Baby Spinach – My go-to choice is Arugula, but if I’m feeling frisky, I’ll pick up some Baby Spinach instead. OR, if you’re feeling totally rebellious, mix them together as you throw your head back and laugh manically! Sunburst Tomatoes – For most of my life I turned my nose up at cherry tomatoes or anything that slightly resembled them. WHAT WAS I THINKING? Holy mother of Solanum Lycopersicum, these little golden treats pack a sweet & delectable punch! They add a unique compliment to the tangy, slightly bitter flavors of this salad. Avocado – I mean, really, how can you go wrong with avocado? It’s the best and most, er, one of the most versatile fruits. (I sat here for a good 6 minutes and argued with myself about whether an avocado or a lemon is the most versatile fruit – I’m torn!) 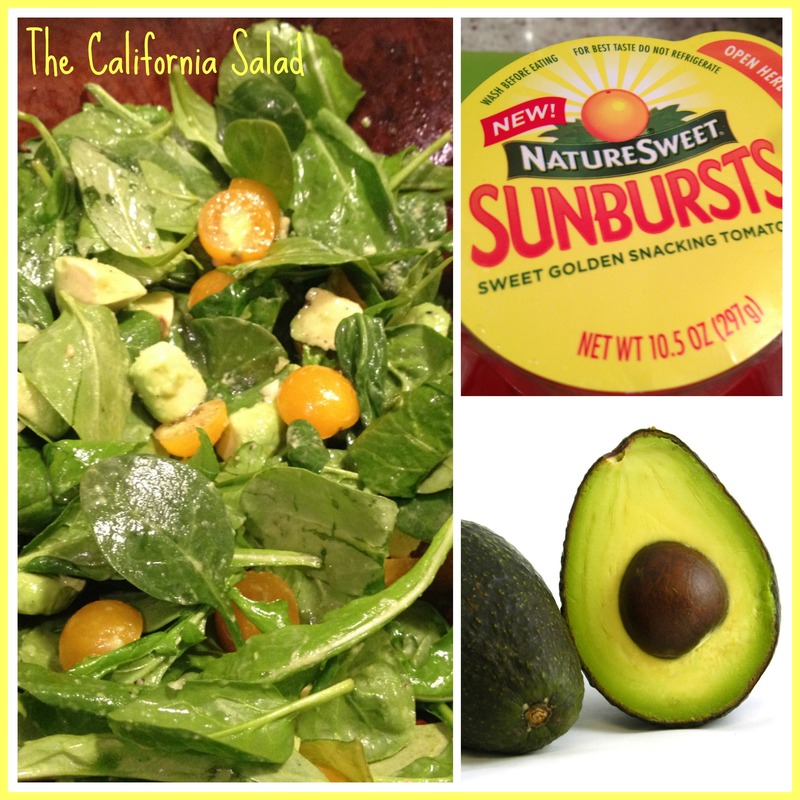 I could eat avocado on ANYTHING & it lends some creaminess to this salad. Growing up in Northern & Southern California, we had avocado trees & come to think of it – why don’t I have one now? Ok, I just decided I’m going to propagate the next pit of an avocado. Lemon – I love lemons, too. And I do squeeze them on just about everything, so one day when I was sick of making dressing & just wanted something light & simple, I squeezed lemon all over the salad. Hello!? Why had I never thought of this before? Lightbulb! Olive Oil – Just a little so that it all melds together nicely. So like I was saying … You can eat this alone, or with your best buddy if you are nice enough to share. Kidding, I mean, you can eat this as a stand alone salad, or it accompanies pretty much anything from chicken, to turkey chili, to white bean vegan soup, to grilled salmon or even barbecue!